What most secular media outlets have not reported about the rescue of the miners trapped in the Chilean copper mine is the faith of the miners and the interesting "coincidences" that occurred along the way to their rescue. The mine collapsed on August 5th, the feast day of Our Lady of the Snows. The miners were not sure if they would ever be found. However, a white butterfly that found its way down into the mine is credited with saving two of the miners, and gave them hope that their prayers would be answered. On August 22nd, the feast of the Queenship of Mary, a drill broke through from above and they were able to communicate with their rescuers. Explaining how his faith continually “shaped this job,” Hall recalled the day he left his parish in Houston, Texas to travel to the mine. “Our priest called me up on the altar ... we had probably over a thousand people. He told them that I was leaving right after Mass to go to Chile, and what we were going, and had them pray for us. Interestingly, the patron saint of miners is St. Lawrence, a deacon. Hall will be ordained a deacon for the Diocese of Houston next February. The miners were also sustained by prayer from around the world. The holy father, Pope Benedict XVI kept a flag signed by the miners in his private rooms to remind him to keep the trapped men in his prayers. The miners themselves set up a shrine in their confinement. A crucifix and other religious articles were sent down to them. As one miner put it after his rescue, "There were 34 of us down there. God never left us." God certainly never left them. And the intercession of the Blessed Mother was clear. When were the miners rescued? 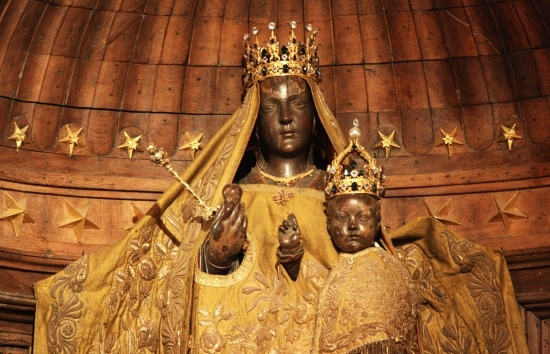 The first miner was brought up to the surface on October 12th, the Feast of Our Lady of the Pillar, whose shrine is maintained in Zaragosa, Spain. When Pope John Paul II visited there, he called Our Lady of el Pilar the "mother of Hispanic peoples." As they say, for those who believe, no explanation is necessary. However, for those who do not believe, no explanation is possible. Update: The last of the miners were rescued on October 13th, the date of the final apparition of Our Lady at Fatima and the miracle of the sun.